The term "hay baler" refers to a particular piece of agricultural equipment used to harvest hay. Hay includes grasses and other plants called legumes. Timothy Grass, alfalfa, and clover are common hay crops. These crops, used as animal feed, are cut with a mowing machine when they are about 18 inches (46 cm) tall and still green. The mowing machine cuts and crimps the forage and discharges it into a 4-feet (1.2 m) wide windrow. This crimping process breaks the stems and makes the hay more palatable to cattle. A hayrake is used to turn the hay over so that the windrow can dry completely. The baler gathers the cut hay from the windrow and compresses it into square- or round-shaped bales for easy transportation and storage. Most hay is stored as bales, with small square bales weighing 40-70 pounds (18-32 kg) and large round bales weighing 750-2,000 pounds (341-908 kg). Small bales must be protected from rain and snow in a dry place such as a barn or hay shed. The large round bales can be left outside because the rain will run off the sides, instead of soaking through and rotting the hay. Small bales can be fed by hand into feed bunks or hay feeders. The larger round bales are handled with a tractor equipped with a "bale mover," a spear-like attachment that pierces the bale and allows the hydraulic loader to lift and transport it to the feeder. During the late 1800s and early 1900s, farming was changing dramatically with the introduction of many new machines. Until that time, hay had been stored loose in the upper story of the barn, or "haymow," where it took up considerable space. By compressing the hay, or baling it, more hay could be stored in the same amount of space. One of the first balers was powered by horses walking on an inclined treadmill. As the leather and wood treadmill belt moved with each step of the horse, it turned a shaft that operated a chain drive. The chain drive, through a variety of sprockets, drove a plunger into the baler, which compressed the hay. Hay was hauled to the baler from the field in wagons, and then forked into the bale chamber by hand. Wooden blocks were dropped into the chamber when the bale reached the right size. Wire or twine was then threaded around the bale and tied by hand. As technology improved, the steam traction engine replaced the horse, and the internal combustion tractor eventually replaced the steam engine. By the 1930s, balers were attached to tractors, and they automatically picked up hay from the ground. Improvements in hydraulics allowed the introduction of the large round baler in the late 1960s. Companies such as John Deere, New Holland, and Hesston have continually refined the baler into a modern farm implement. Hay balers are pulled behind and powered by the tractor in the field. The baler has flotation tires, which reduce the damage to the hay stubble by distributing its weight over a larger area. Also connected to the tractor is the Power Takeoff Shaft (PTO), which transmits rotary power from the tractor to the baling mechanism. Along the sides of the hitch are the hydraulic hoses that operate the various controls on the baler using hydraulic pressure from the tractor. When operating the baler, the tractor pulls the baler pickup, a horizontal spool of moving steel teeth, in line with the windrow and engages the PTO drive. The hay enters the baler through the pickup, and the teeth gently rake the hay from the ground to prevent the loss of leaves and ingestion of rocks or debris into the baler. Directly behind the pickup is the compressor bar, which holds the hay in place so the auger can feed it into the bale chamber. The bale chamber contains a plunger that drives in and out, each time packing and compressing hay into the desired shape. The plunger also cuts the ends of the hay to make the bale an uniform size. The chamber feeds into a spring tension section that keeps the bale tightly compressed until enough hay has been processed to complete the bale. When the correct length of bale is achieved, a mechanism wraps the bale with two lengths of twine or wire and ties it securely. The twine is carried on spools and fed through two curved needles that are timed to miss the cycle of the plunger. After the twine is in place, a gear mechanism called a knotter ties the knot and cuts the twine free of the supply spool. All of this motion occurs in less than two seconds, and must be carefully timed to prevent interference with the continued operation of the rest of the baler. After it is tied, the bale is pushed down the bale chute and falls to the ground. Some balers have "kickers," or bale ejectors, which throw the bale onto a hay rack pulled behind the baler. Like the small baler, the large round baler uses a pickup to load the hay from the ground into the bale chamber. Here, how-ever, the hay is wrapped onto itself by six to eight long rubber belts that are 7 inches (18 cm) wide. As the hay is drawn into the machine, the bale becomes round and fills the bale chamber to capacity. The hay exerts force upon the belts, which is in turn monitored by the hydraulic system. Once a predetermined pressure is reached, a signal is transmitted to the tractor operator. The operator stops the forward movement of the baler, and the bale is automatically wrapped with twine or protective sheeting. After wrapping, the tension on the belts is released and the entire rear portion of the baler is opened by hydraulic cylinders. The bale then simply rolls out onto the ground. The baler is pulled ahead, the rear closes, and baling resumes. The entire process can be operated from the tractor, and bale ejection takes from 15 to 45 seconds. Balers are constructed primarily of structural and sheet steel. This steel can be in bar stock, sheets, or in rolls. Hydraulic cylinders, pumps, wheels and tires, belts, and other components are purchased from suppliers and shipped to the baler assembly plant. The belts are made of nylon and polyester, a material similar to tires. All raw materials are carefully specified by the engineering staff after extensive testing and research. Many portions of the baler arrive as subassemblies, put together by divisions of the baler manufacturer or by independent suppliers. Balers are constructed primarily of structural and sheet steel. This steel can be in bar stock, sheets, or in rolls. Hydraulic cylinders, pumps, wheels and tires, belts, and other components are purchased from suppliers and shipped to the baler assembly plant. parts without physically adapting the machine. This is important, as one machine can then produce hundreds of different parts, in any random order, and provide them to the rest of the manufacturing process as needed. 2 Bar stock steel that is used for frames, shafts, arms, and other structural parts is cut using a band saw. These saws have many toothed cutting blades driven over two large wheels. The wheels rotate and move the blade continuously to cut through the bar. Bar stock can be round, square, rectangular, solid or hollow, plus many other shapes specific to the desired application. After cutting to length, holes and slots are drilled, punched, or milled into the parts as needed. Structural parts are usually fabricated close to the welding area to minimize time between operations. 3 Welding is performed primarily by robotic welders. These machines are operated by a computer that has been programmed to move the welding electrode wire through a specific range of motion. The robotic welder is very accurate and makes high-quality, repeatable welds. After the various components are clamped into a large welding fixture by the operator, the robot extends a short piece of welding wire from the welding gun. With the welding current turned off, it gently touches a computer sensor that accurately defines the exact position of the wire tip. Then, the robot touches the tip of the wire to each of the components in two or three places. All of this touching is actually transmitting data to the computer about the exact location of the components in reference to the desired location of the weld. Once complete, the computer program compensates slightly for any deviation from the exact position. The welding current is turned on and the wire is fed into the arc while the robot moves the gun along the joint. This insures that the welds will be exactly at the proper place and achieve the highest possible strength. It also prevents welding any misplaced or incorrect parts, reducing scrap and possible machine failures. In many critical applications, robotic welders can be more accurate than a human welder because of this type of programming. The hay enters the baler through the pickup. Directly behind the pickup is the compressor bar which holds the hay in place so the auger can feed it into the bale chamber. The bale chamber contains a plunger that drive in and out, each time packing and compressing hay into the desired shape. feet (3 m) wide. They contain 20,000-40,000 gallons (75,700-151,400 1) of paint. The paint is suspended in a water solution and charged with a negative electric charge. The parts are charged positive, and when the parts submerge into the solution, the electrical attraction of the two charges sticks the paint tightly to the metal. The parts are hoisted out of the tank and allowed to drip before they are placed into a drying oven. This drying oven heats the parts to approximately 365°F (185°C), which bakes the paint into a hard finish. Because balers are used and sometimes stored outside, a good finish is needed to protect the steel from rusting. 5 After painting, the frame of the baler is placed onto a wheeled cart. This allows the baler to be moved and assembled at a variety of work stations, each adding specific components and performing quality checks during production. The hydraulics, pickup tines, bale tensioners, knotters, and subassemblies are bolted into place. Many design features create special hole patterns, tabs, pins, notches, and other forms to prevent the parts from being assembled in the wrong place or position. After assembly, the hydraulic systems are filled with oil, belt and chain tensions are adjusted, and the bearings greased. The baler then has the tire and wheel assemblies mounted and identifying decals and stickers attached. Since a baler can be a very dangerous machine, many warning labels are applied to caution operators to keep their hands away from the moving parts. 6 Finished balers are finally inspected and operated without hay to check the functionality of all the parts. Most are shipped by truck or railcar to dealers all over the world. A technician may be sent out to the field with the new baler to instruct the operator and make final adjustments. Often, changes in the hay crop will require occasional adjustment to the baler to produce quality bales. During a production run, balers are closely inspected at various stages for proper function and durability. Whenever possible, features are designed into parts and processes to prevent incorrect parts and subassemblies from leaving the assembly line. Occasionally, a completed baler is taken from production for testing either by special test equipment or by actual field trials. Subassemblies can be tested and even destroyed without sacrificing the entire baler. Data acquisition computers are used to record the test performance and, using Computer Aided Design (CAD) programs, offer engineering changes to improve performance. Like automobiles, balers have local service dealers that can notify customers of correct maintenance procedures and/or new features that may be retrofitted to existing balers. 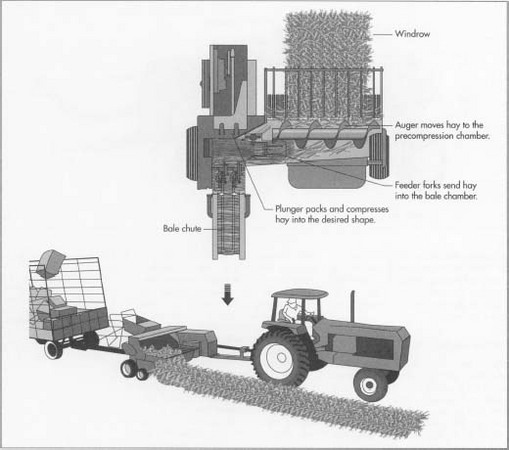 Processing hay for animal feed has improved greatly in the past 20 years, primarily due to the advent of the large round baler. Even larger balers are on the market, but the round baler seems most popular at present. As the size and complexity of the machine increase, so does the cost. Custom balers, people who bale for resale, are a large portion of the new baler market, along with large corporate farms. These operators usually have the larger tractors to power big balers, and with improvements in hydraulics and bale wrapping, the large baler will probably be the standard for the next several years. I still don't know when the first one was made. I see western movies with stacks of baled hay and I wonder if that is accurate. I spent many hours on John Deere balers and now in my old age, I want to know about the beginning of that machine. Like Craig's question, what was in use c1850? The letters I have 1846-1856 refer to shipments of Hay by Schooner from Maine to Boston as an example. How was the Hay bundled for such shipments? Does anyone have a photo or sketch? Does "Farm Machinery" include any mention? from York, Pa. I was lead to this site trying to find a picture of a "railroad press" as described in the book "Farmer Boy" by Laura Ingalls Wilder. The bales were 250 pounds and bound with ash withes (strips of ash wood). The time period would have been the 1870's. The hay in the barn was not stored in bales. The bales were made in the winter when they sold some to the livery stable in town.